I am such a novice when it comes to cooking in the kitchen. With me, nothing too fancy or exceptionally impressive is to be expected. But that is okay. Everyone has got to start somewhere. Today's recipe is a simple, but delicious one! 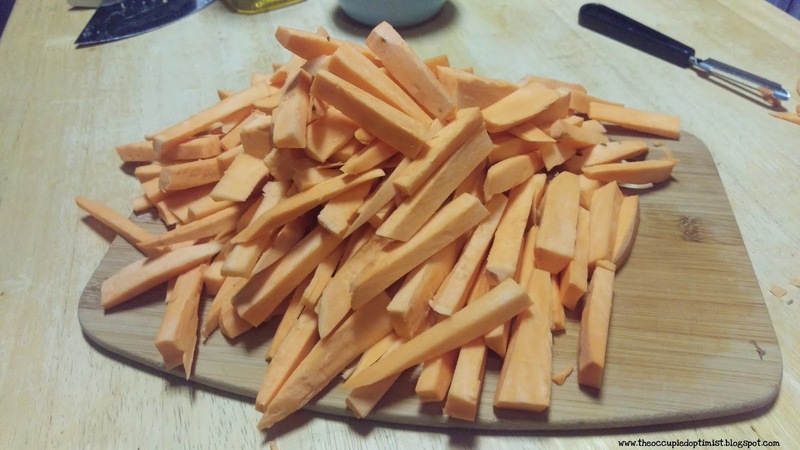 Who wouldn't love cooking some savory summertime sweet potato fries! I always crave french fries in the summer and sweet potato fries are a delicious alternative. 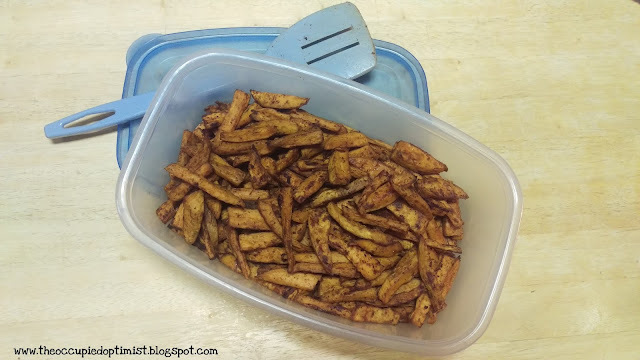 Check out the recipe that I used, provided below, but first you have to check out THIS very helpful post which provides excellent tips on how to ensure that your sweet potato fries come out nice and crispy. Line baking sheet with parchment paper. I have also tried using foil; sometimes when I have neither of those on hand, I just spray the sheet with oil which also suffices. Cut potatoes into 1/4'' fries. 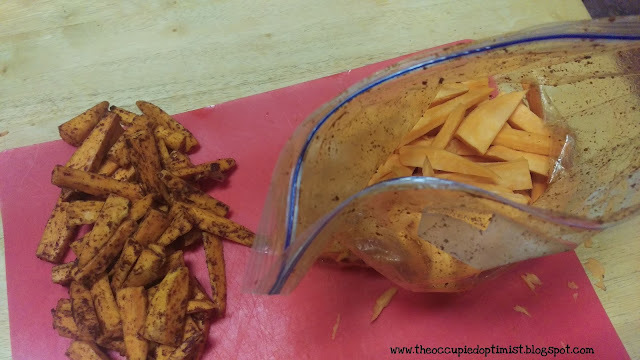 Put fries into a gallon sized Ziploc bag with oil and all spices EXCEPT SALT, and shake up; Mixing in spices, making sure that all the fries are coated well. Spread fries out evenly on the prepared baking sheet. Season with salt. Serve. Enjoy. That knife looking tool with the moose on it is the best, most efficient thing I've ever used in my kitchen! I've never seen anything like it, have you? It just appeared in our "gadget drawer" one day. With house mates moving in and out over the years, I never know what belongs to who, or where some of the things in my house even came from, But I LOVE this tool! It is so easy to grip and cuts like no other! It makes cutting my potatoes into fries, a breeze! I use it for all my fruits and vegetables. an all-purpose knife traditionally used by Inuit, Yup'ik and Aleut women. 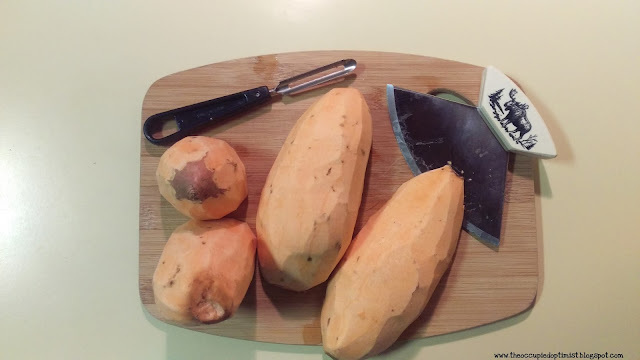 It is utilized in applications as diverse as skinning and cleaning animals, cutting a child's hair, cutting food and, if necessary, trimming blocks of snow and ice used to build an igloo. ...Like Alaskan Eskimos probably take the credit for this amazing tool! How can I convince you further that you need to get one of these things? As I've shared, my Ulu works great in the kitchen, but how cool is it to know that it can be a multi-purposed instrument! I have some Ulus listed in my amazon store if you are looking into owning one. They are work the investment! 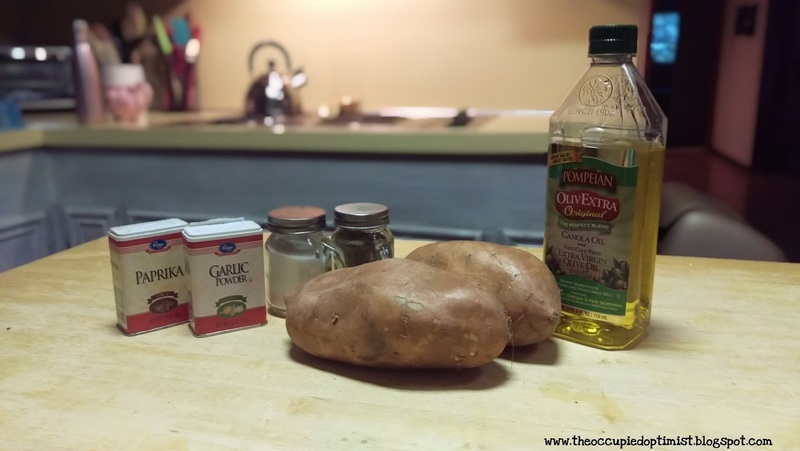 Soak potatoes in cold water for 45 minutes to an hour before preparing to cook them. This draws out excess starch allowing your fries to cook at the way through better. Cutting your fries into equal sizes, and spacing them evenly on your baking sheet will allow them to cook at the same rate. Cooking less rather than more, at one time is key! You don't want to over crowd the poor little sweet potato fries. They need proper space to allow moisture to easily escape and evaporate quickly, otherwise your fries will steam rather than bake. Adding salt to your fries AFTER they've been cooked is better than adding it to them before. Cooking your fries with the salt will draw more moisture from your fries, causing more steam, and jeopardizing their crispiness. Buena Suerte & Buen Porvecho!